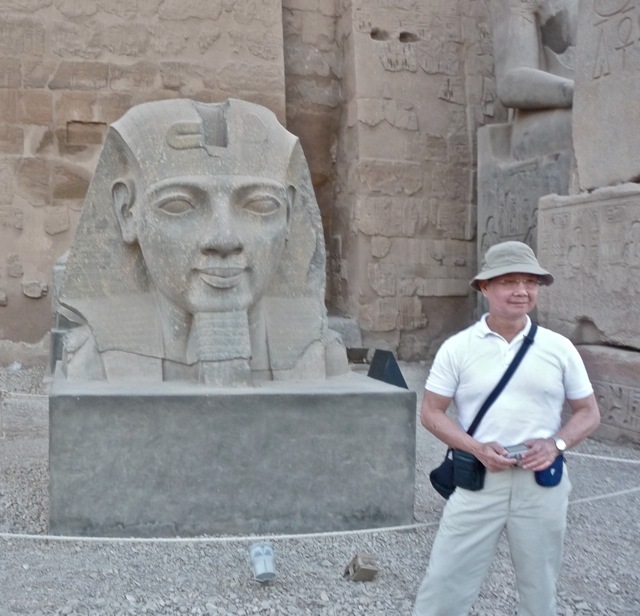 We visited Egypt earlier this year and saw many ancient monuments. Many of these monuments were built beginning 4,500 years ago. Due to geographical barriers, ancient Egypt was relatively isolated for many centuries, developing its unique culture, religion and language. It remained basically intact for 3,000 years until it was overwhelmed by Arab invasions in 600 AD and absorbed into the Muslim Arab culture. 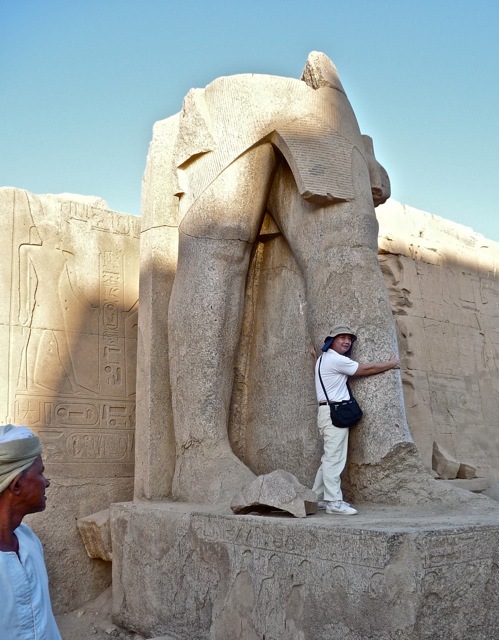 When we visited Egypt, we found the people and the ancient monuments were completely divorced from one another. The peoples’ everyday lives and customs had no connection to the ancient Egyptian culture nor the extinct hieroglyphics writing, except as a reason to make a living selling trinkets or working as guards and guides. 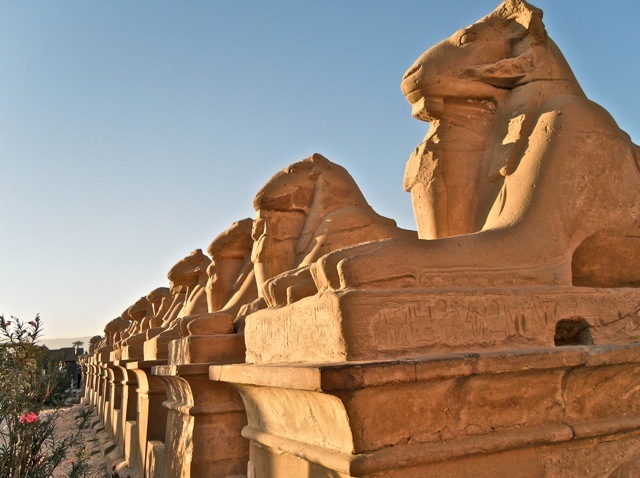 Tourism to see ancient Egyptian relics is a major source of income for the country today, but the monuments seemed to be alien transplants into an Arab country. 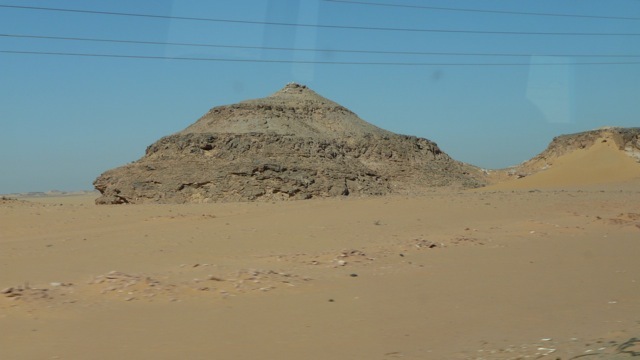 While we traveled in the desert, I saw eroded hills that perhaps were inspirations for pyramids. The pyramids developed from pharaoh’s tombs which had stone or mud brick platforms (mastabas) built over them. 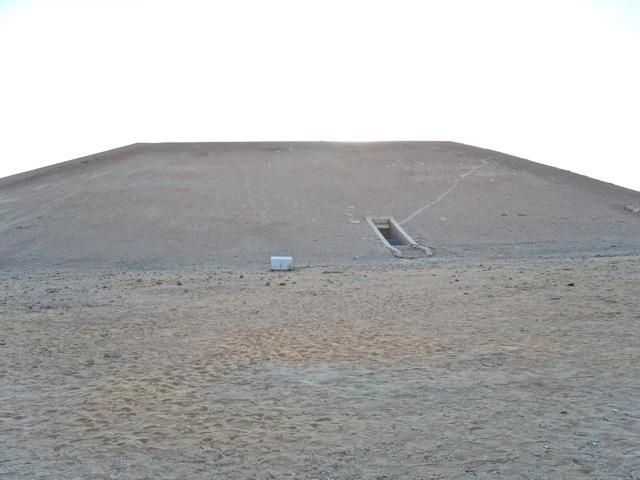 When one pharaoh’s tomb was enhanced some 4,500 years ago with six successively smaller mastabas stacked together, the Step Pyramid was born. 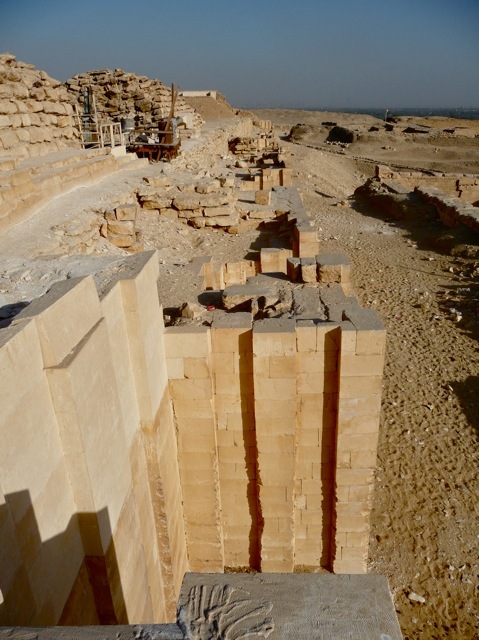 The enclosing walls of the Step Pyramid was well-built with precisely cut and carefully aligned stones. Any house built today would be proud to have masonry of this calibre. Then the ancient Egyptians experimented with smooth sided pyramids. THe first ones were built with sides too steep and had to be flattened out higher up to avoid collapse. 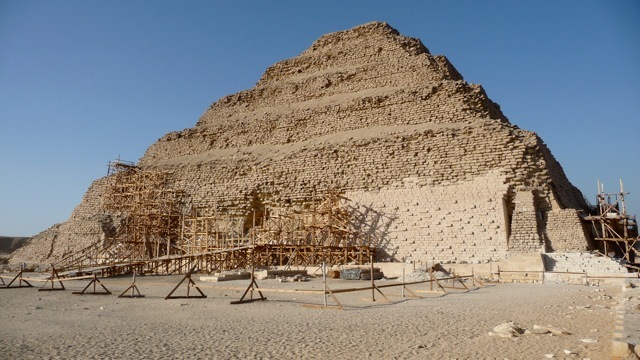 These were the “bent pyramids” on the left. Eventually, the ancient Egyptians found the perfect angle and built the familiar pyramids we see today. 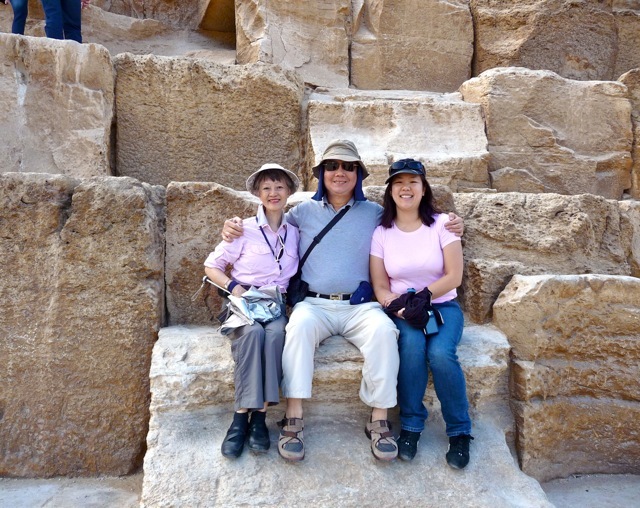 Sally, our daughter Tammy and I sat on a boulder of a pyramid at Giza. Millions of these 3-ton stones were used to build one pyramid. These stones formed the core of the pyramids, then precisely cut and polished limestones were used to form a smooth cover for the pyramids. Almost all the limestones have been stripped by later date Egyptians to build their houses. 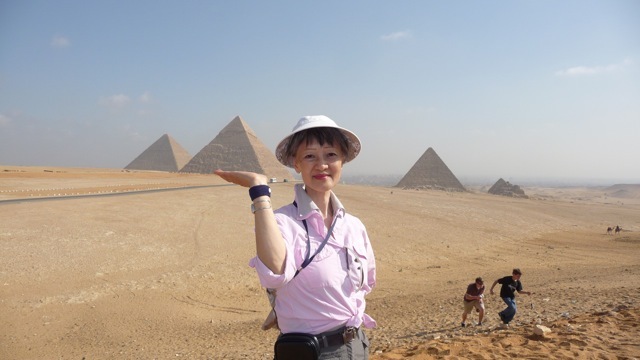 Sally demonstrated her superhuman strength by lifting up one pyramid. This pyramid is the only one with some limestone cover left at its apex. 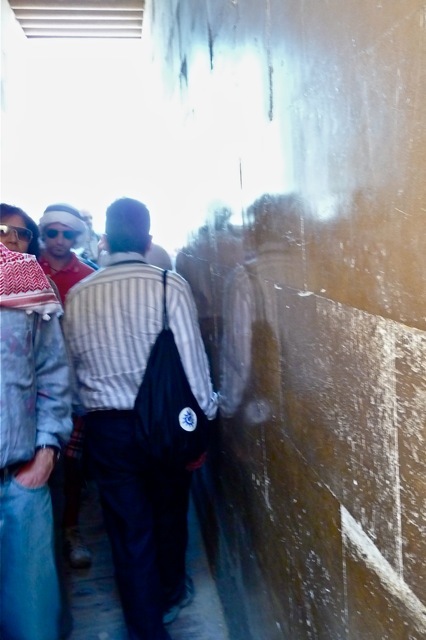 The limestone wall of a busy passageway is polished into a mirror finish by crowding tourists. When the pyramids were covered with such polished white limestone, they must have shined blindingly in the sun. The sphinx near the Pyramids of Giza was covered by sand and had to be dug out. 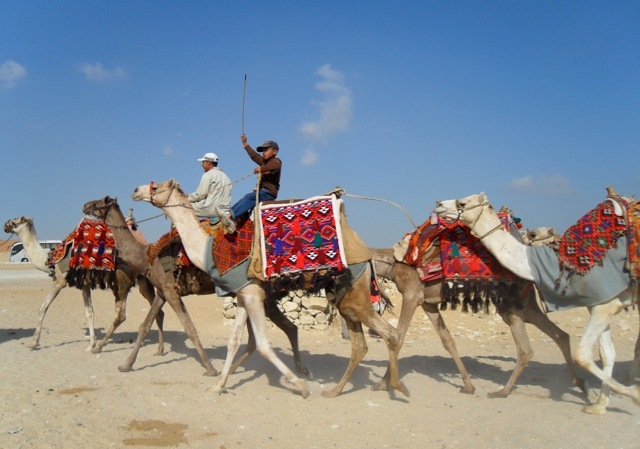 Camel jockeys raced their beasts near the pyramids, going after tourists. 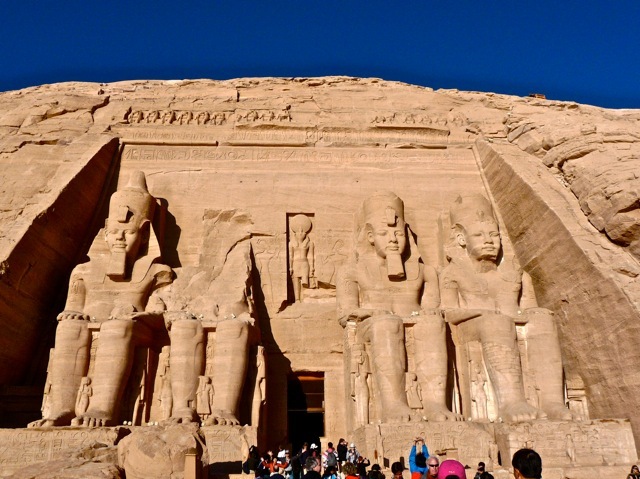 We visited the temples of Abu Simbel. These temples were threatened with inundation by the rising water of Nasser Lake reservoir. United Nations mounted a rescue project, cut the temple into pieces, moved them to higher ground, and reassembled them. 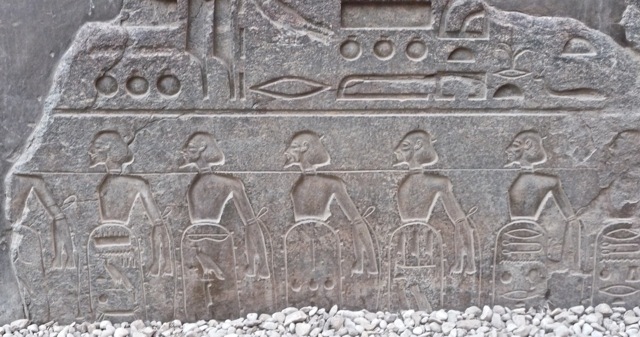 The four colossi were carved in the image of Pharaoh Ramses. 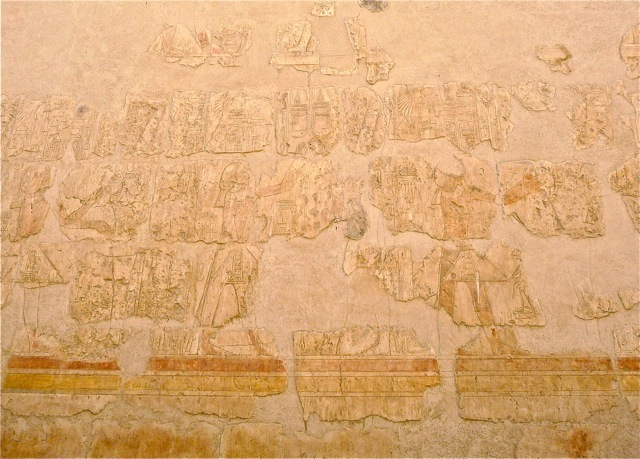 Ramses’ victories were documented by images of bound captives. The rear of the reassembled temple rests against a dirt-covered artificial hill with an entrance into its steel structured interior. 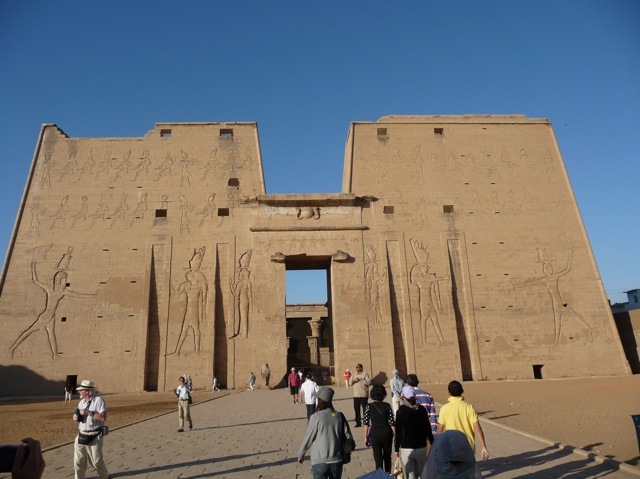 Ramses’s Temple is accompanied by another temple dedicated to his queen. This is unusual as queens seldom had temples built in their honor, and it demonstrates how his queen stood in this pharaoh’s heart. 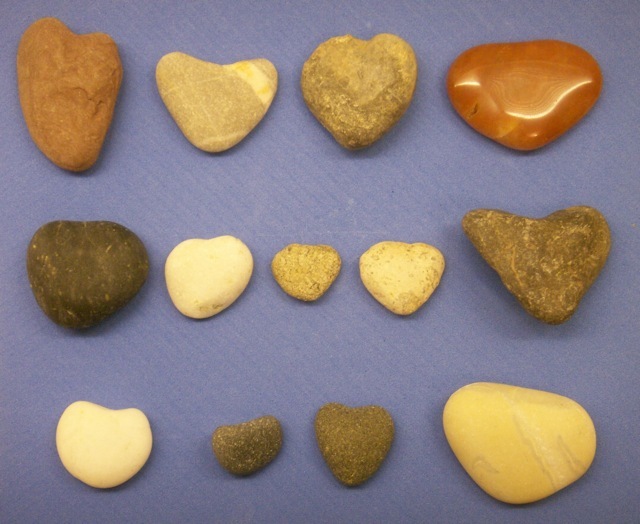 Here, I searched for heart shaped stones among the pebbles. On my visits to interesting places, I collect heart shaped stones for Sally. They are actually rare and and take lots of effort and luck to find. These are some of my hoard. 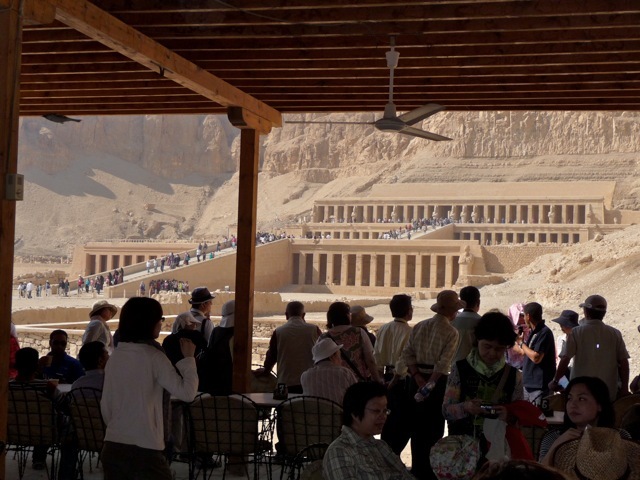 We visited the Valley of the Kings where dozens of pharaohs were buried. All the tombs were robbed earlier and no treasure was left in those tombs except hieroglyphics on the walls. 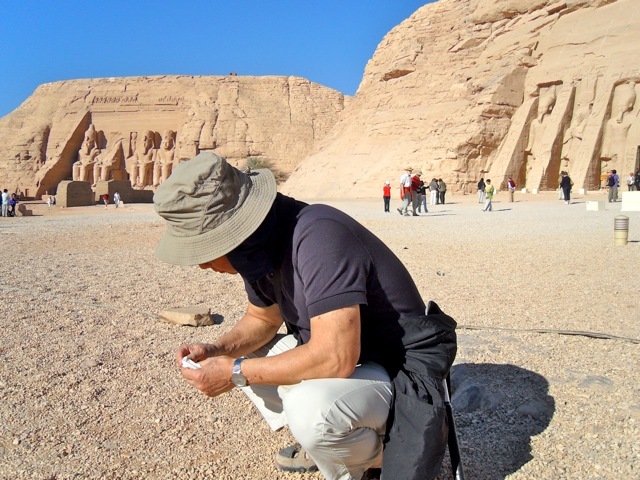 When we entered the Valley of the Kings, we had to check our cameras. I have no photo record of that tour. The serendipitous discovery in 1922 of King Tut’s tomb and its intact treasure rvealed the splendor of ancient Egyptian art. 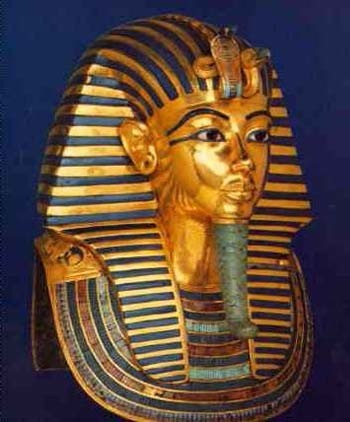 I have to download from the web photos of King Tut’s gold death mask, coffin, and tiny alabaster bottle stops since they are stored in the Egyptian Museum in Cairo which also bars cameras. They attest to the lifelike artistic tradition and the masterful skills of the ancient Egyptians 3,300 years ago. Egyptian art heavily influenced Greek art, and therefore our current Western art. Hatshepsut was the first woman pharaoh in ancient Egypt. She built a magnificent temple outside of the Valley of the Kings, and it was promptly destroyed shortly after her death. It has been restored and is attracting thousands of tourist each year. In 1997, terrorists massacred 67 tourists here, and the government instituted very extensive protection of tourists in Egypt. 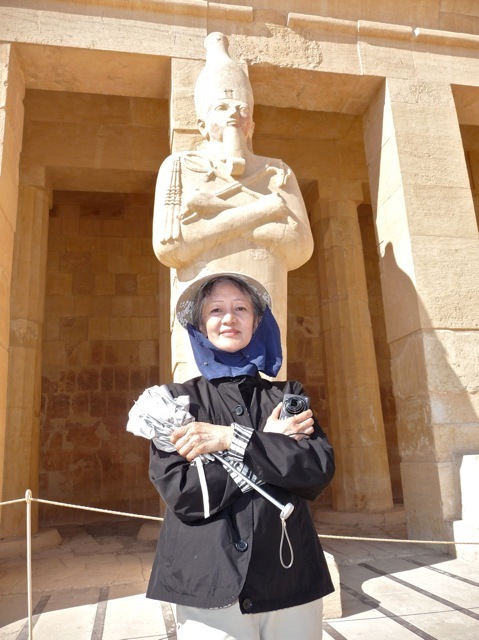 Sally stands in the royal stance in front of the other woman pharaoh’s statue, holding her essential modern scepters of an umbrella to shield the sun and a camera to record the scenes. Two gigantic sitting statues are all that remains of a temple. 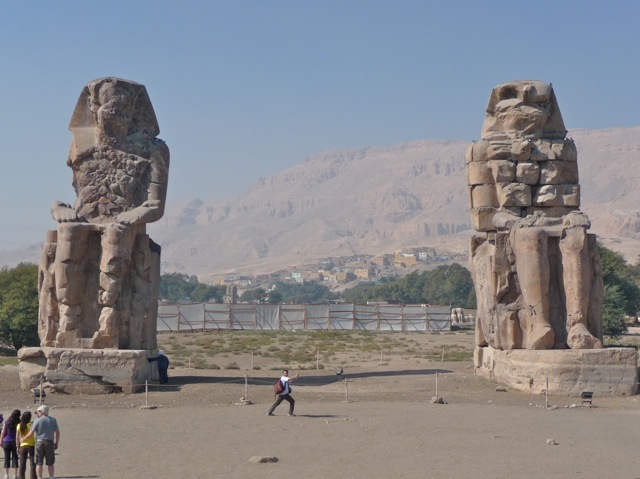 These two 60 feet-tall Colossi of Memnon could have inspired the features of the alien monster in the movie Predator. 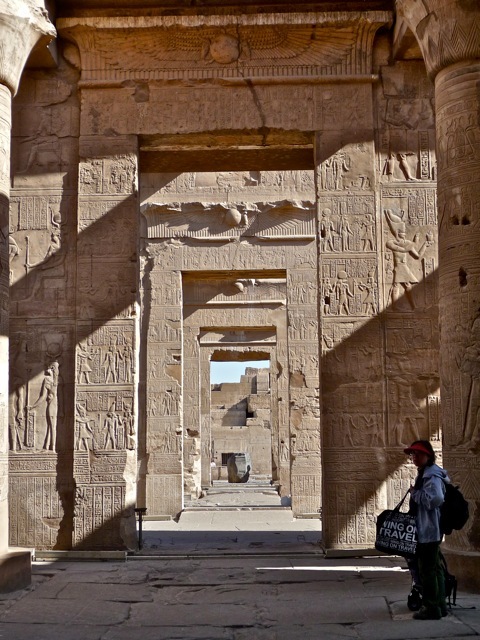 This Temple of Horis at Edfu has the typical entrance pylons of ancient Egyptian temples. 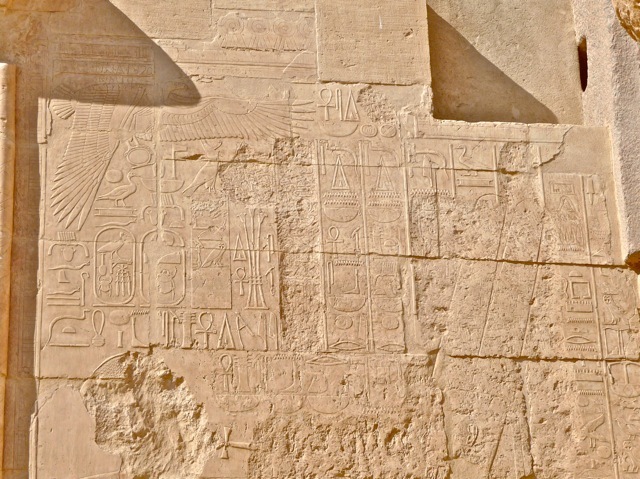 Its front wall is decorated with images of the pharaoh winning battles and being anointed by the gods. This falcon is the largest one in Egypt. Made from hard granite rock, it withstood tests of time with little damage. 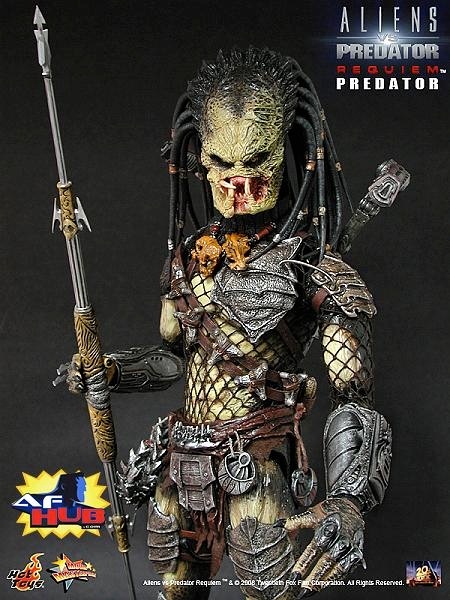 Its fierce stare still sends chills down onlookers’ spines. 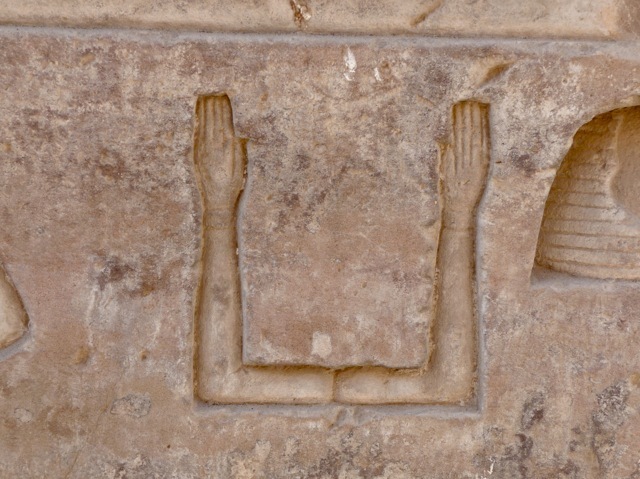 Hieroglyphics were formal writing reserved for temples and monuments. For everyday writing, ancient Egyptians used simpler cursive scripts. 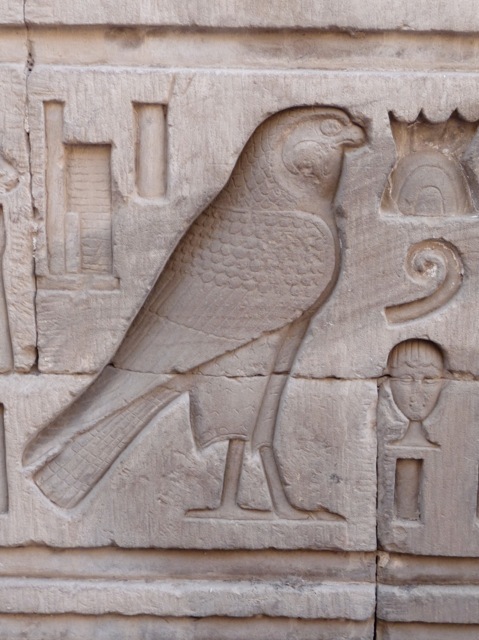 This hieroglyphic falcon illustrates how artistic and meticulous the carvers were in Ancient Egypt. Its feathers and fierce expression are delicately and accurately portrayed in limestone. 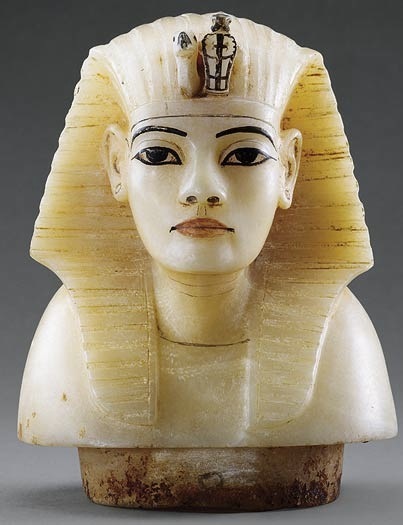 The frontal face in the lower-right-hand corner is a rare exception from the familiar face profiles in Egyptian art. I think hieroglyphics should not be that difficult to decipher. Any fisherman can tell you this symbols means “that big”. 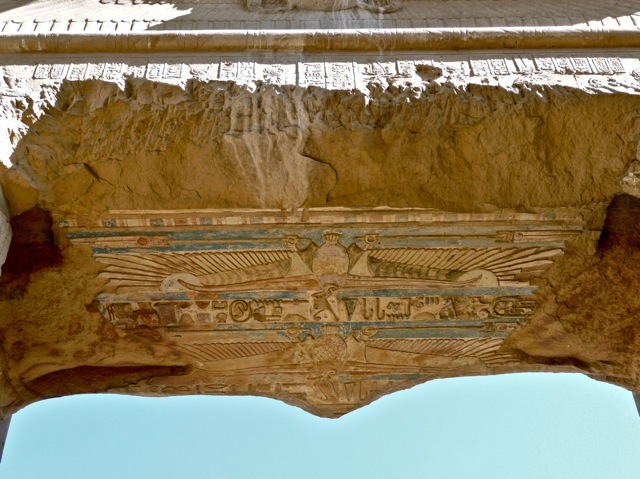 Images under stone beams retain the carvings and colors of sacred vultures. It’s surprising how well preserved some of these pictures and colors are after so many thousands of years. 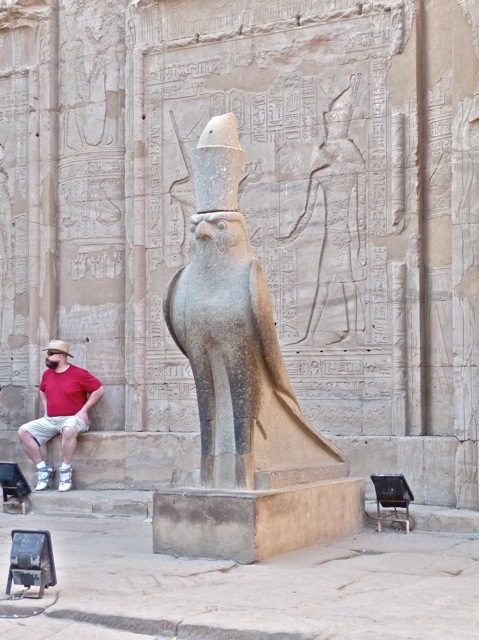 At the Karnak Temple, rows of ram-headed sphinxes guard the road to the entrance. 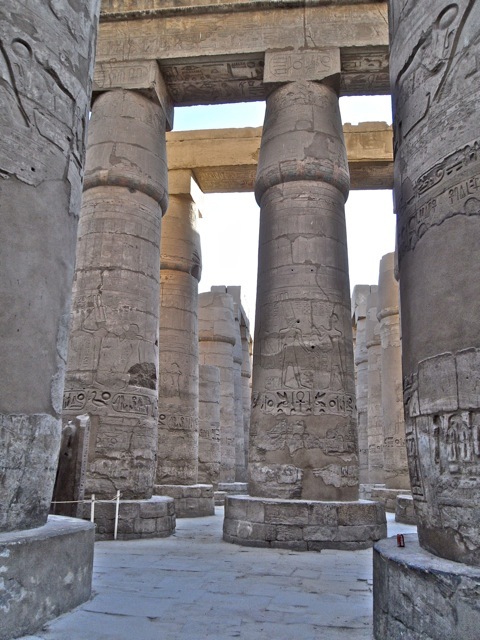 Densely packed gigantic stone columns support stone beams and a roof. Every square foot of the columns is covered with hieroglyphics. When intact, this hall must have been very dark and awe-inspiring. I hugged the leg of a granite statue while an irate guard was shouting at me to get down. I was naughty, naughty, naughty. At the entrance to the Luxor Temple, graffiti from various eras remain. 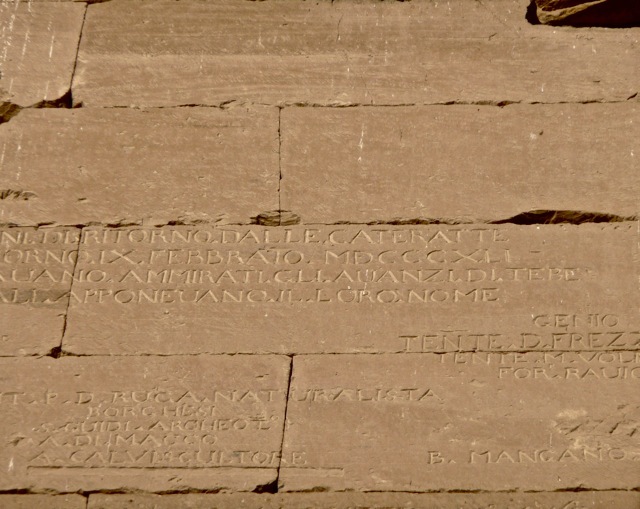 This one in Latin could have been carved by Roman visitors 2,000 years ago. The head of Ramses’ statue stands outside Luxor Temple. I am very impressed by the ancient Egyptians who could carve and polish this beautifully lifelike bust out of granite. Granite is very hard and had to be chiseled with even harder volcanic basalt rocks. Egyptians had copper tools but they were too soft to work on granite. Desecration took its toll on some relics. On this wall, selective images were chiseled out to erase their specific religious messages. Unlike the Great Cultural Revolution in China 40 years ago when all relics were indiscriminatorily destroyed, the ancient Egyptians had more respect for their cultural heritage. Some relics were reassembled from small scattered fragments. This badly fragmented wall must have given archeologists serious headaches. 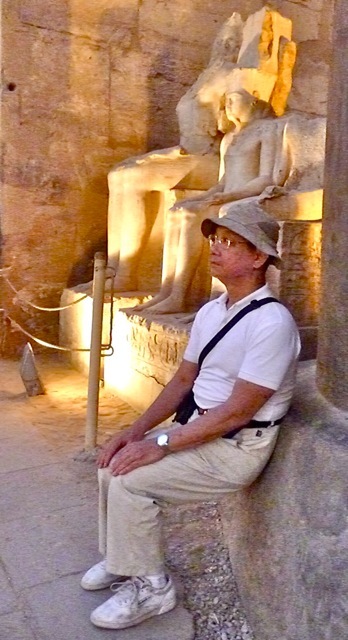 I wanted to experience being a pharaoh and sat on a phantom throne. The temple of Kom Ombo by the Nile is unique in being one symmetrical building with two temples dedicated to two different gods. 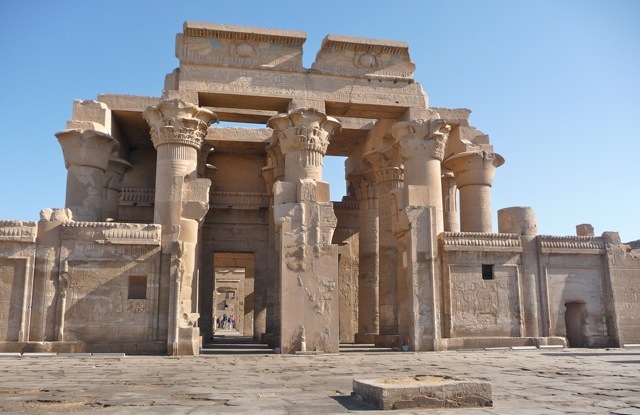 This temple was built only about 2,000 years ago during the Greek Ptolemaic dynasty, so it has been evolved from the ancient Egyptian traditions thousands of years earlier. The temple has many halls separated by hieroglyphics-covered walls. The stones walls were first built, and then stone masons carved hieroglyphics on the walls. They had to be very careful for mistakes could not be rectified on built walls. The walls were still covered in hieroglyphics, illustrating how long that language had been in use before its extinction. 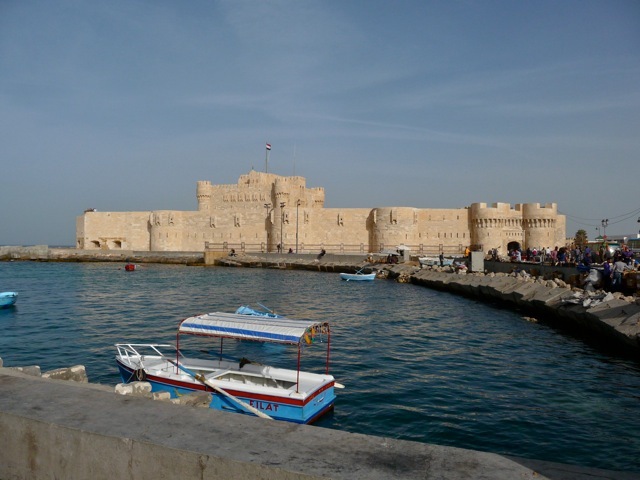 Besides the pyramids, another one of Seven Ancient Wonders situated in Egypt was the lighthouse of Alexandria, built 2,300 years ago. The 400 feet tall lighthouse was destroyed by earthquake and this medieval fort was built on its site in the 1400s, using some stones from the demolished lighthouse. 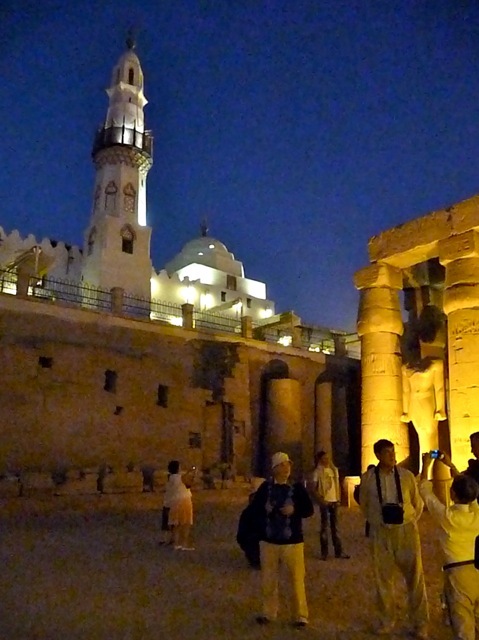 At the Luxor Temple, a mosque stands dozens of feet above the excavated relic. The Luxor Temple was buried by centuries of sediments and became lost to history, and Muslim Egyptian unknowingly built the mosque on top of the relic. 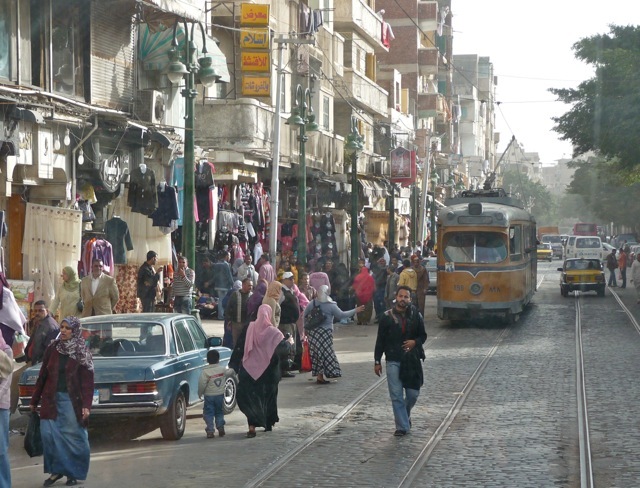 Today, Egyptian culture is no different from those of all other Arab countries. Its Arab language movies are widely distributed in the Arab world, and Egypt maintains a strong leadership role among Arab countries. It took European scholars decades to decipher hieroglyphics and revive the ancient language, which is still incomprehensible to the average Egyptian. To the average Egyptian, ancient Egypt is as alien as ancient China. This total amnesia of a people provokes a postulation. Ancient Egypt flourished for 3,000 years before its extinction, a time span equal to China’s recorded history. Knowing how much transpired in China during its 3,000 years history, ancient Egypt must had an equally rich history. Yet almost all of that rich history is lost. When Japan invaded China in the first half of 20th century, Japan was intent on wiping out Chinese cultures, force Chinese to use Japanese language, and adopt Japanese culture. Japan did that earlier in Korea and Taiwan. If Japan succeeded, Chinese culture could have gone extinct like the ancient Egyptian culture. Then in another few hundred years, all Chinese would forget its glorious history, rich culture, and sophisticated language. We would all be using Japanese products, eating raw fish, watching Japanese soap operas, and trying to emulate the Japanese. But wait, isn’t that what young people do in Hong Kong nowadays? The Japanese culture is conquering us after all. Posted by Robert Wu on Friday, April 30, 2010, at 8:11 pm. Filed under Uncategorized. Follow any responses to this post with its comments RSS feed. You can post a comment or trackback from your blog.